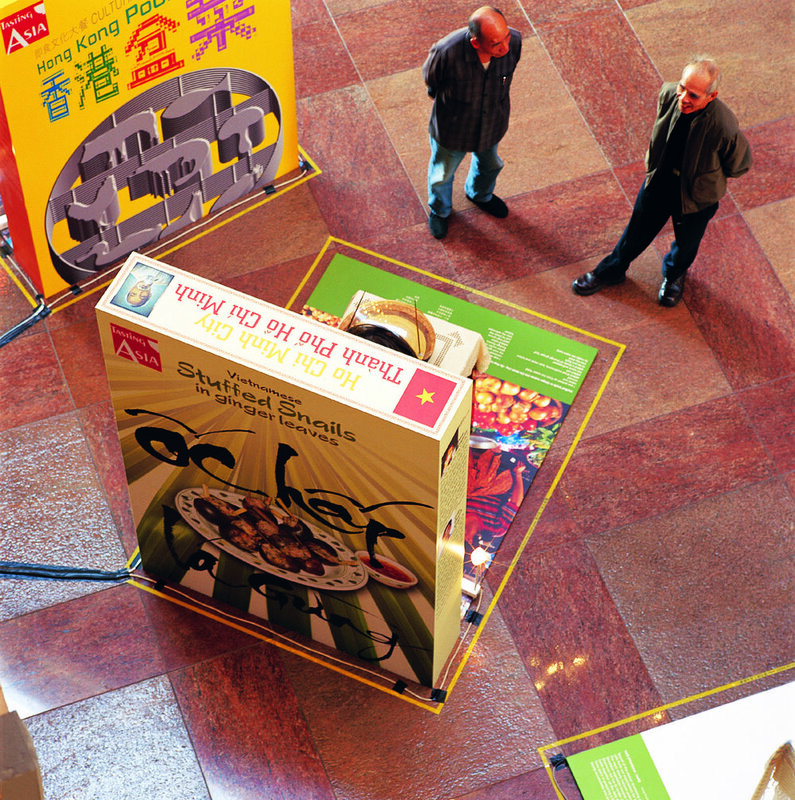 Tasting Asia was a reflection of Asian attitudes towards food; and an early experimental collaboration between graphic designers and fine artists from Asia, as well as Prof. Leung Ping-kwan (whose pen name was Yesi), a renowned Hong Kong poet and intellectual. 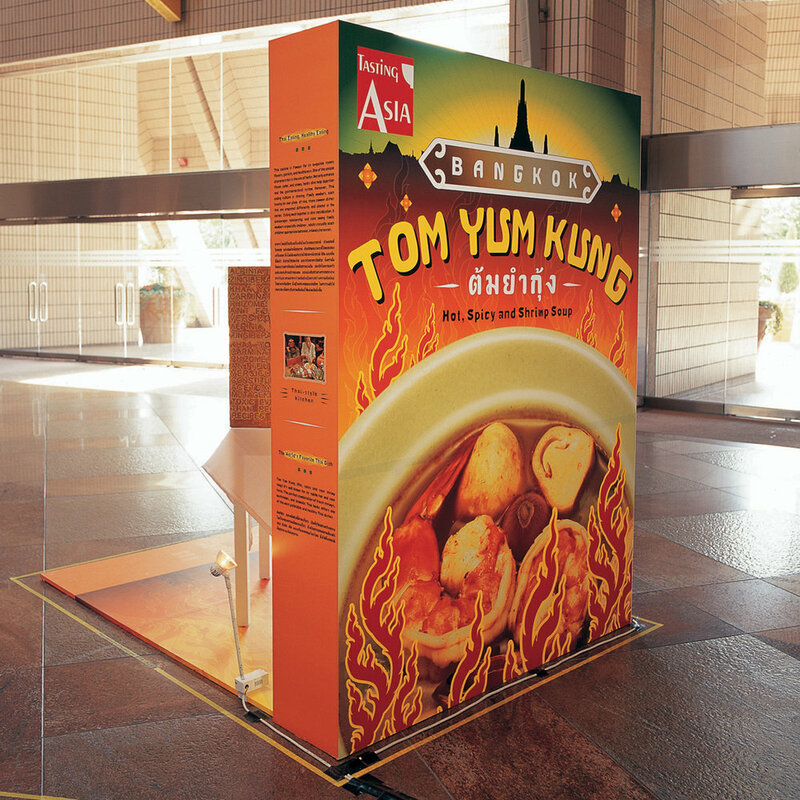 A popular traditional dish was selected from each of the eight participating Asian countries as the inspiration for graphic designers to create their make-believe packaging, and for artists to come up with a conceptual work that fit on a small tabletop during the exhibition. 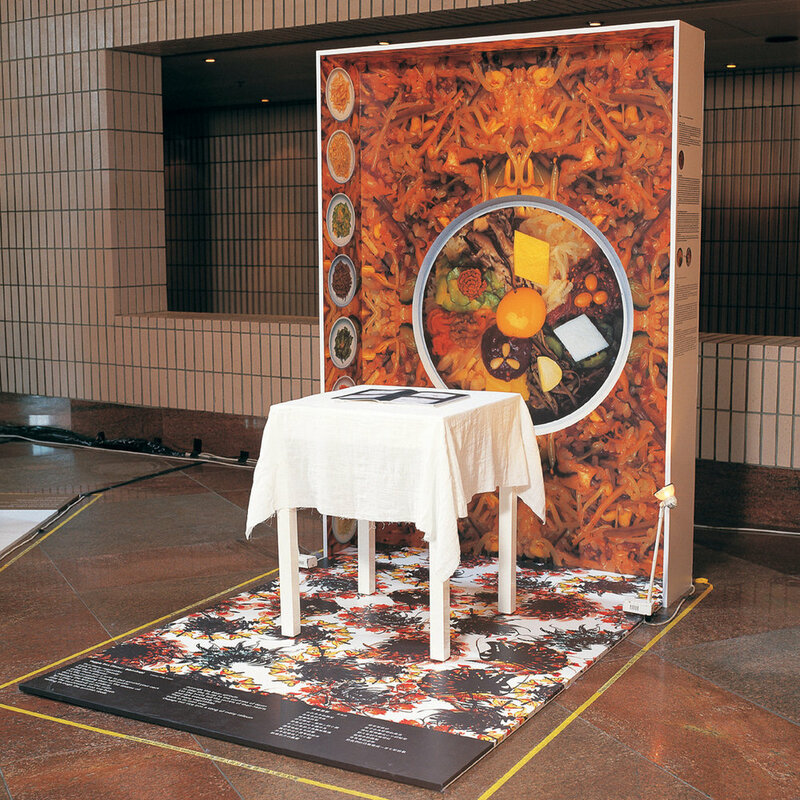 The exhibition booths were replicas of the designers’ packaging, and they also doubled up as a storage space for the table, table-cloth, lighting fixtures and the artist’s work (some artists used the table-cloth itself as a canvas for their work). The booths were designed for easy setup, packing, and transporting—all that was needed was to place everything in the box, close it up, and ship. 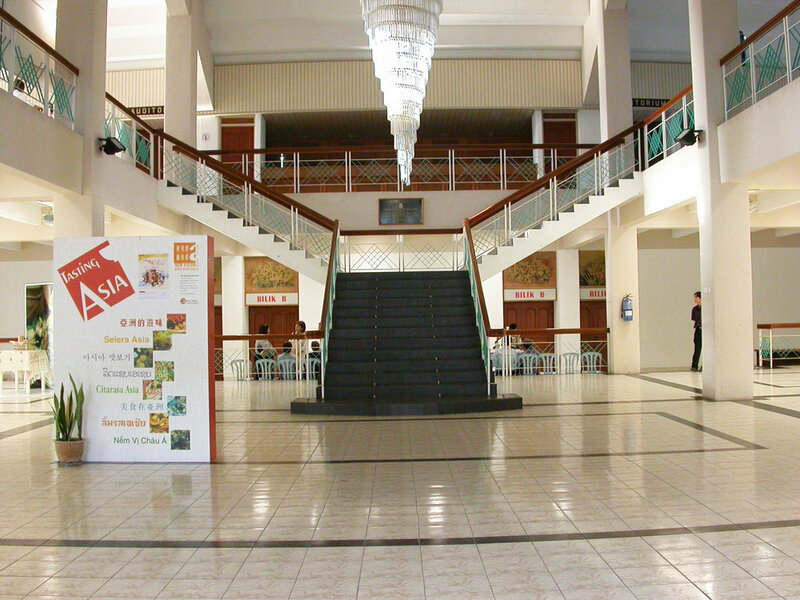 All eight member countries of The Design Alliance*—Hong Kong, Indonesia, Laos, Malaysia, Singapore, South Korea, Thailand and Vietnam—participated in the exhibition. *The Design Alliance was renamed The Design Alliance Asia (tDA Asia) in 2011. As of January 2018, tDA Asia is represented in 13 countries/regions. 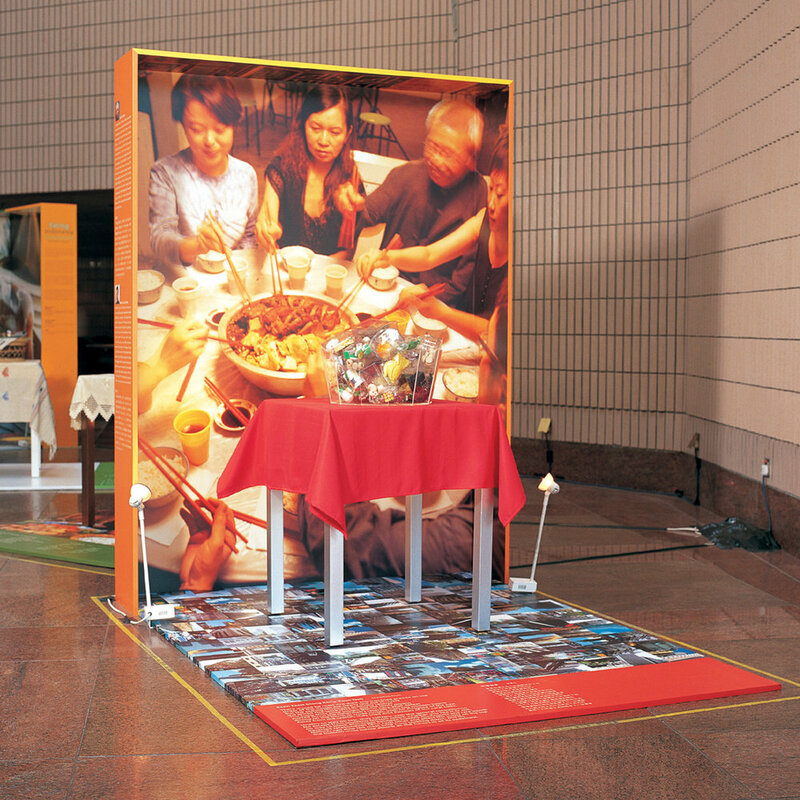 The exhibition ‘catalogue’ took the form of a shrink-wrapped ‘variety pack’ box set (similar to a breakfast cereal mini box set)—ironically, a western product, but which is popular in modern Asian households (Will there be an Asian version of this concept?). 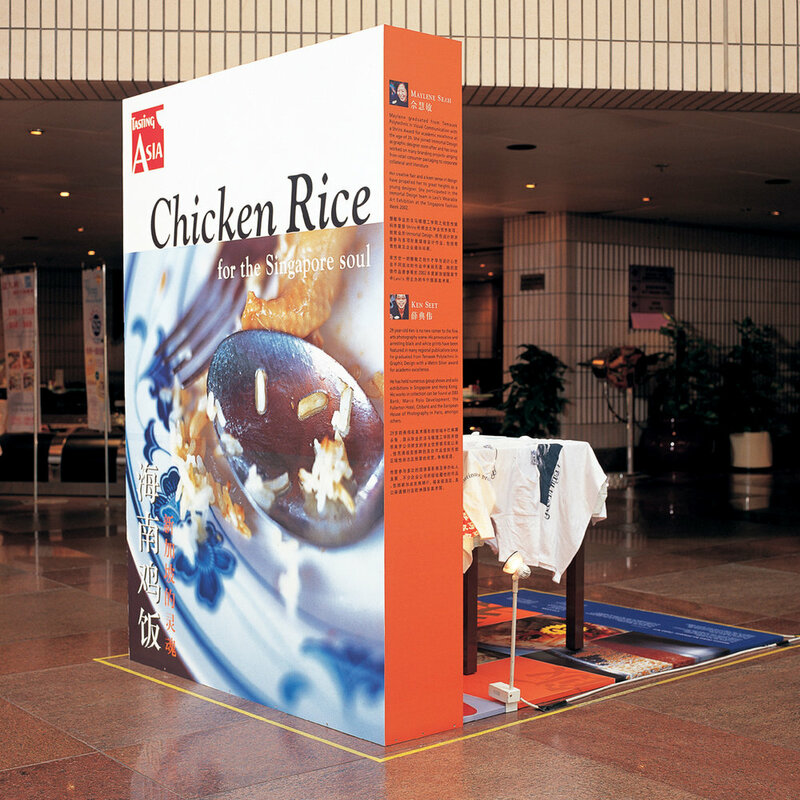 Each box contains a leaflet with information about the food, its recipe, an introduction the artist/graphic designer, and the respective poem by Prof. Leung. Yesi (Leung Ping-kwan) passed away on 5 January 2013. 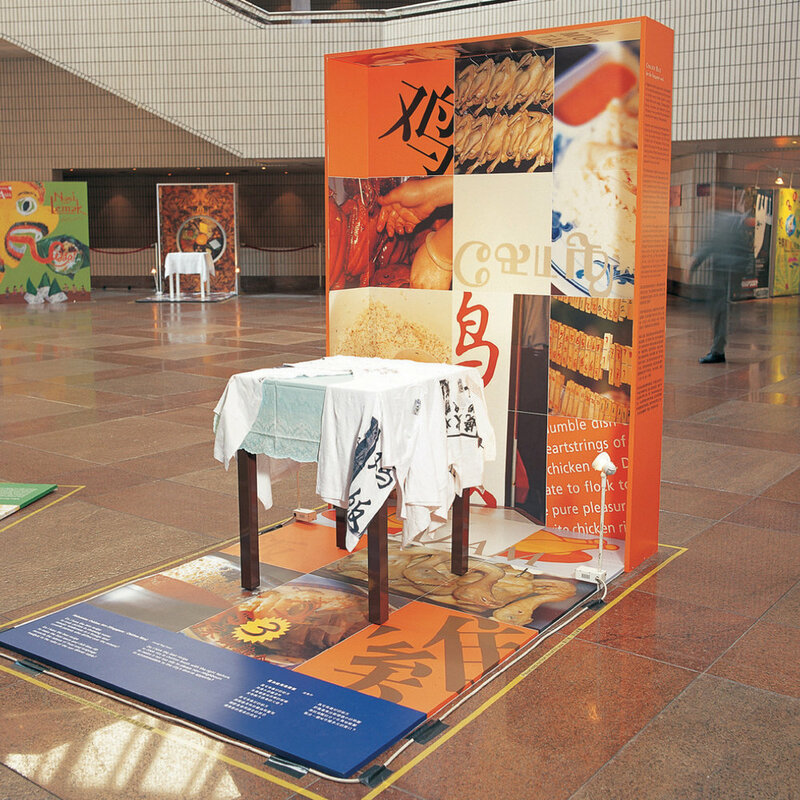 In January 2014, a major exhibition of his life and work titled ‘Leung Ping-kwan (1949—2013), A Retrospective’ was held at the Hong Kong Central Library as homage to the prominent cultural figure. 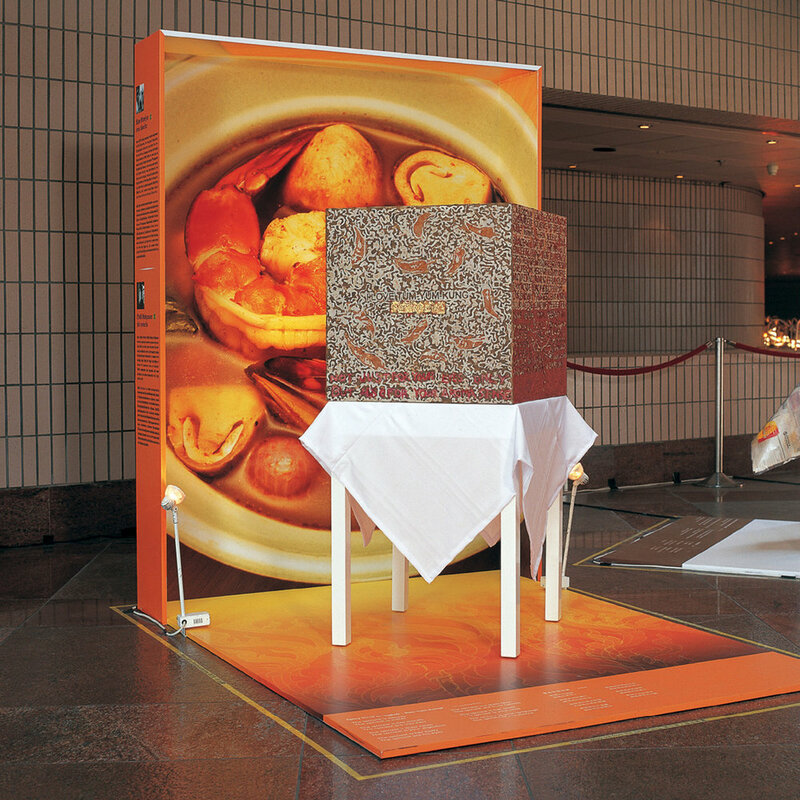 I was informed by Mr Oscar Ho, the lead curator for Prof. Leong’s Retrospective exhibition, that the full set of Tasting Asia will be exhibited under the ‘Foodscape’ section, alongside with over a hundred artworks from Hong Kong and abroad. Here, I reproduce Prof. Leung's poems written for Tasting Asia as a tribute to his immense talent. I imagine it must have been difficult for him to write for some of the food, such as Malaysia’s nasi lemak, having had little to no familiarity with them. After all, even though you may encounter these foods somewhere in Hong Kong, they may not have the original, authentic flavours as the ones found in the home countries (which may also differ from district to district). But a poet overcomes all. Malaysians typically consume nasi lemak for breakfast, although it can also be eaten during lunch, tea break, dinner, or midnight supper; either at a humble roadside stall, restaurant or in a 5-star luxury hotel. *Nature and its cycles is an intrinsic part of Chinese thought and philosophy. The changing seasons represents the cycle of life—things sprout and begin to grow (spring), bloom (summer), and reach completeness (late summer). Then, they begin to dry and wither (autumn), rest (winter), and the cycle restarts all over again. This essential idea remains even though Malaysia only have the dry and wet seasons. The Chinese in hot, tropical Malaysia is also keenly attuned to the concept of changing seasons as they celebrate occasions such as the Mid-Autumn Festival and Winter Solstice. Larb was originally a word used by Lao people to mean receiving something from an endeavour (e.g. hunting, fishing, or doing business). If someone is able to get a good haul from their hunt or at sea, or is successful at business, they are said to have larb. Singapore’s international, multicultural society has contributed to the diversity of the island state’s culinary offerings, earning it a reputation for being a food paradise. However, the humble Hainanese chicken rice is a local dish that continues to capture hearts with its juicy chicken, fragrant rice cooked with chicken stock, and chili-garlic dip. Bibimbap is a popular Korean rice dish with mixed ingredients and gochujang (hot pepper paste), known for its taste and nutritional value. Research indicates that the bibimbap was created based on the conventions of the yin-yang and Five Element Theory, thus resulting in a dish that features vegetables of various colours to strengthen different parts of the body. Thailand’s tom yam kung—a combination of fresh shrimps, mushrooms, and aromatic Thai herbs—is well known for its subtle hot and sour taste, and is one of the most palatable and healthy Thai dishes. 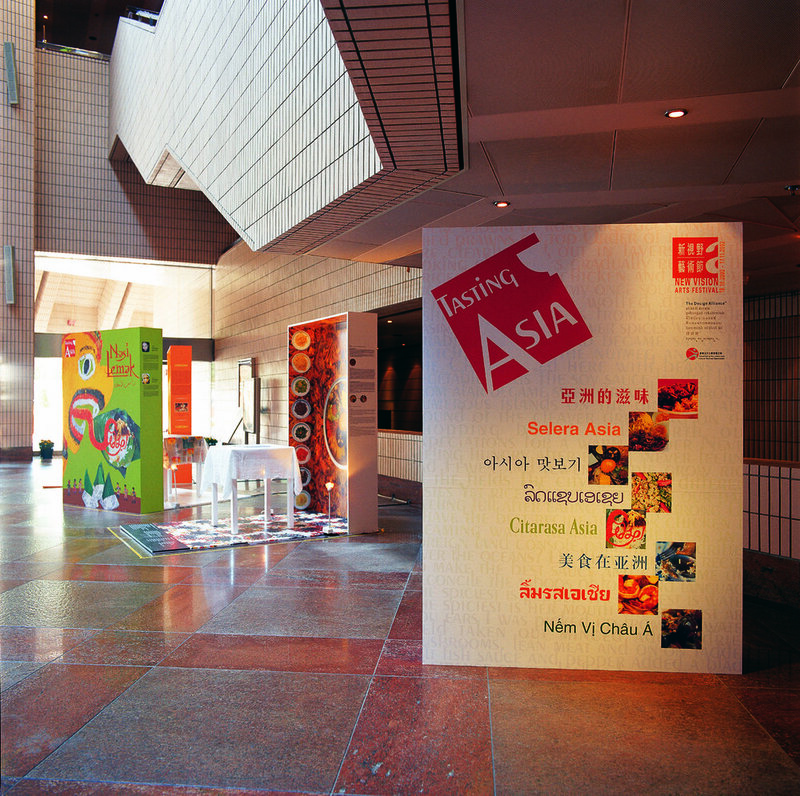 Tasting Asia was The Design Alliance’s first group project. It was a test-bed for collaboration among our associates from eight Asian countries, overcoming language barriers—English is not the mother tongue or the first language for many of our associates—and logistical issues. Some associates were already internationally renowned (South Korea, Hong Kong), while other associates (Laos, Vietnam) were just making their mark as designers in their respective countries—Tasting Asia may have been their first collaborative design project beyond their national borders. 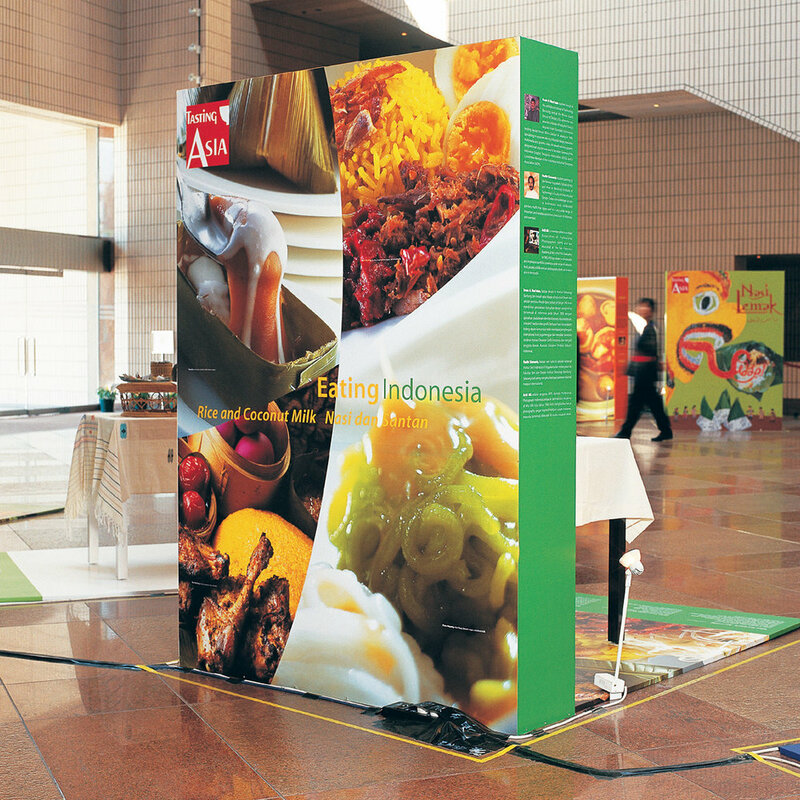 The final installation of Tasting Asia may not be perfect, but what was important was the beginning of a professional relationship among our associates, which has strengthened over the years leading up to the present day. Tasting Asia (and subsequent collaborations) fostered a keen curiosity and a deeper understanding of Asia’s diverse cultures. Ten years later, this close working partnership enabled tDA Asia to win one of Asia’s most prestigious award for its research project Colours of Asia.